Barefoot Luxury at it's best, this tropical estate is 3 minutes from the beach!! Lovely White Water & Mountain Views. Private Gated Community. A main Villa plus 2 Full Casita's totaling approx. 4,700 sq.ft. ; 7 bedrooms and 6 baths; with a Vacation Rental Business established! Ideal location!!! Situated atop the canopy at 350ft. elevation above Dominicalito beach and fishing port in a 24hr gated security gated community development. Don't worry, the Villa has 1 3\4 acres and you don't feel like you're in a closed-in housing track with other houses around. The Villa is located in the La Reserva area of the prestigious Los Olas Exclusive Residential Community, 2km south of Playa Dominical. Views encompass white water beaches and an incredible high mountain range. Coastal beach views extend all the way to Manuel Antonio. Year round gorgeous sunsets await you at this tropical estate The access is an easy 3 minute drive from the coastal highway on a well maintained road. 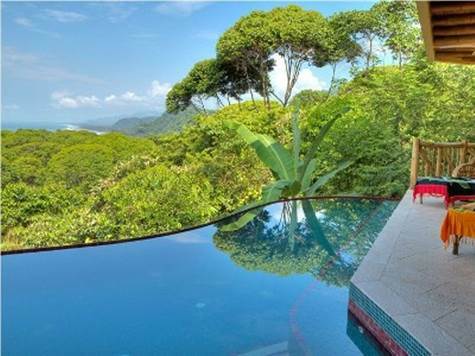 A protected reserve surrounds the Villa and Casita's on 3 sides and attracts numerous species of jungle wildlife and guarantees there will be no further development that would compromise your privacy. The Main Villa has 4 bedrooms & 4 bathrooms, plus a loft. The modern/tropical style has lovely 35ft high bamboo ceilings. The large kitchen looks out over the living room and to the pool. The infinity pool has custom tile work, a swim up bar and views looking out over the jungle canopy to the ocean. The covered patio creates a great space to enjoy outdoor living: a fantastic area for a BBQ; entertaining guests poolside; or viewing the passing jungle wildlife. Down a picturesque walkway from the main villa are 2 Master Casita's. Both have full kitchens, living areas & verandas. Each Casita can be used for an extra rental guest house or a caretaker's house or for the owner's to live while the main house is rented. Both houses were built from concrete with wood & bamboo finishes. This style of construction insures longevity while the bamboo and local hardwoods give it a beautiful tropical feel, and is eco-sustainable. The combination of the estate's location and the floor plan make it a popular rental. If you'd like a steady stream of secondary income via rentals, this is ideal!!! 25 feet above the Canopy Infinity Swimming pool with Swim-up Bar. 2 outdoor organically styled showers (beach & pool). 2 Extra Master Casita's (perfect for caretaker, manager or guests). Air Conditioning and #20 ceiling fans for comfort. Separate laundry room. 3,500 sq. ft. main Villa plus 2 Full Casita's; with approximately 4,700 sq.ft. of usable living space. Landscaping with lots of fruit trees - with bananas and papayas being abundant. This is the epitome of casual, tropical living!!! Whether you are looking for an income producing property or large family home, contact me today to see this beautiful property.